Right around mid-Spring, all around Berlin, sprout the cutest strawberry stands filled with the most picture-perfect strawberries you’d ever seen. The sunshine-yellow seeds that stud each of the fruit look as if they are slowly becoming enveloped by the plumpness of their juicy, crimson colored flesh. One of my best friends, Sandy, in front of one of the many strawberry stands in Berlin. The sight and smell of the mouth-watering berries always conjure up ideas on the limitless ways one can enjoy their sweetness. All of which come second to enjoying them just as they are. But when creativity takes hold, one way we enjoy them is as a raw jam. 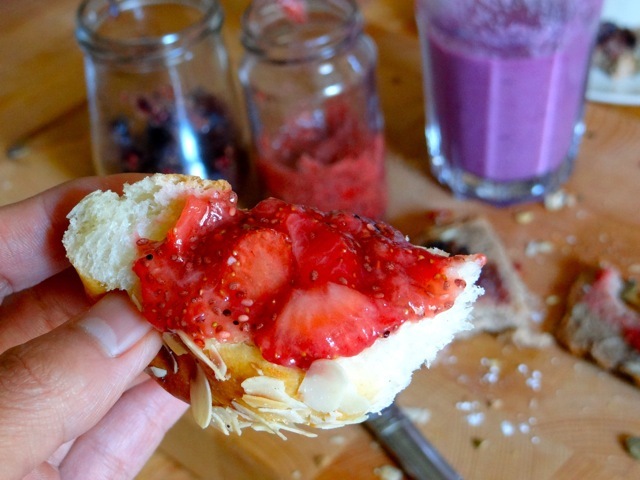 I add chia seeds to sliced strawberries, which thicken the mixture and gives it its jam-like texture. Chia seeds are nutrient and antioxidant rich. I also use them in dessert puddings like my Chia Coladas and in smoothies and juices. Another benefit to this recipe is that the strawberries are raw, unlike in traditionally made jams and jellies where all the nutrients are destroyed in the cooking process. Depending on the sweetness of your berries, you could omit or reduce the use of sugar. 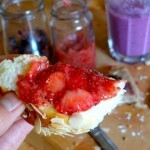 And because this is a raw jam it is best to make and enjoy small batches. The recipe works with blackberries, raspberries and blueberries as well. Place strawberries along with their juices in a small mixing bowl or jar. Add 1 teaspoon of powdered sugar and chia seeds and stir until sugar is dissolved. The sugar will not only sweeten the strawberries but will help macerate the berries, extracting some of their juices. Taste for sweetness, adding more sugar if necessary. Refrigerate for 15 minutes, or until the chia seeds have thickened the jam. Enjoy on your favorite toast or bagel. Since this is raw, I would only keep this in refrigerated for only a few days, so be generous when slathering this on toast or bagels. Alternatively, you can add a few tablespoons of water and pour this over waffles or pancakes. WOW this looks delicious! I didn’t know about Chia seeds until now, nice tip! I like how keeping the jam raw keeps in the nutrients, what a great idea… This is perfect for summer too, thanks for sharing!!! Hey Stephanie! Thanks so much, and you’re right, this is perfect for summer!